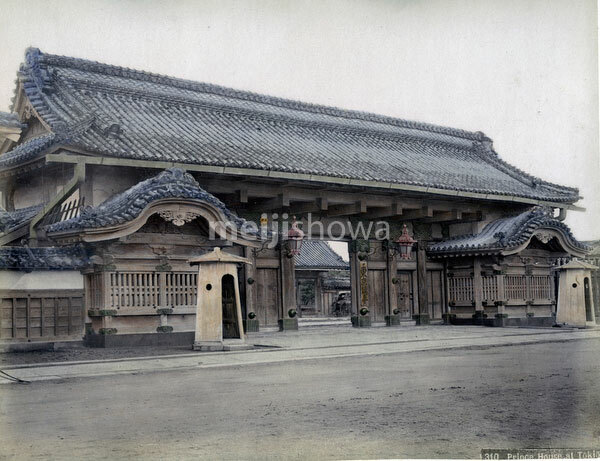 Now popularly known as the Kuromon (黒門), this Nagayamon (長屋門) style gate was originally the main gate to the Edo mansion of the Ikeda family from the Inaba Domain, now part of Tottori (旧因幡鳥取藩池田家の江戸屋敷の表門). It was located in Marunouchi (丸の内), but was moved to Takanawadai-machi (高輪台町) in 1892 (Meiji 25), and served as the main gate for the palace of the crown prince (東宮御所正門, Togu Gosho Seimon). It was designated an Important Cultural Property in 1951 (Showa 26) and moved to Tokyo National Museum (東京国立博物館) in 1954 (Showa 29).